Lennon's 'magical mystery' island . Beatles Radio: The Beatles, Solos, Covers, Birthdays, News The Fab 4 and More! 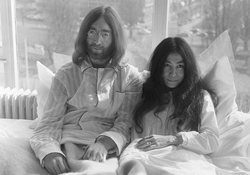 BED-IN FOR PEACE John and Yoko on their honeymoon in Amsterdam where they held a ‘bed-in’. IT is no wonder the arrival on Dorinish Island of Beatle John Lennon and his new girlfriend, Yoko Ono, in June 1968, ruffled a few feathers. Like the majority of Clew Bay’s tiny inner islands, it was uninhabited by humans and happened to be the nesting season for its resident gulls and gannets: a rather stressful time from an avian perspective. The fact that Ms Ono was coiffed with a beehive bun didn’t help the sense of confusion and, naturally, some of the feathered friends swooped on her assuming she was bearing new soft material for their nests.